UPDATE 3/26/2012: Every year, as soon as the strawberries appear at the farmers' market, I want to bake these scones again. I just baked some and took new photos to update the post. There's also a new added note in the recipe regarding the self-raising flour. Every time I see a scone recipe, I want to try it. Kurt certainly wouldn’t mind if I did try every scone recipe, and since I don’t even need much encouragement to bake, I baked scones again. Hopefully, this won’t become a dedicated scone site, but chances are good there will be additional scone variations presented here. These particular scones are another item from Exceptional Cakes , and there’s so much more on my to-bake list from that book. Date shortbread bars or the chocolate caramel tart could be next. But, about these scones, I thought I should compare these to the last scones I baked. These scones were made with self-rising flour which I had never used before. I didn’t even find it at my grocery store, so I made it as described here. An additional two teaspoons of baking powder was added to the homemade self-rising flour. Those ingredients were sifted with salt and sugar, and butter was worked in with my fingertips. Some milk was measured and then eggs were beaten into it and that was poured into the flour butter mixture. I stirred this together and folded in chopped, fresh strawberries. The strawberries were my choice of an addition, but the recipe suggested sultanas. I usually cut butter into flour using a pastry cutter, but this time I worked it in with my fingertips. I think the fingertip method is actually faster, and I definitely had a better sense of when it was well-combined. I may never go back to the pastry cutter. Now, interestingly, the minneola tangelo-buttermilk scones I made in February, used all purpose flour, baking powder, baking soda, salt and sugar. Butter was mixed in with a pastry cutter, buttermilk was added, and then the segmented tangelos and zest were incorporated. There were no eggs in the dough, and there was more buttermilk than the milk in these scones. The tangelo scones were fantastic, and they rose nicely. However, in my opinion, the texture of these strawberry scones was the better of the two. It was more delicate and less crumbly. Warm from the oven, they were incredible, and re-warmed the next day, they were still incredible. Let me know if you have a favorite scone recipe, or if your scones have eggs or not, and I’ll keep trying every recipe I see. Since the book is not available, and I had a request for the recipe, I'm including it below. I've never had strawberry scones before. A great way of using strawberries. Nice way to use up this season's sweet berries! I'll find any excuse to make scones. I love them and I also love the process of making them. These strawberry scones look so pretty. I have some self-rising flour too, but if it's expired it's good to know that it's not hard to make. these are very pretty scones - I saw scones this size in a little bakery the other day selling for $2.50 each. those are just gorgeous! i've never used self rising flour either. i'll have to try it since the texture of these sounds perfect!! THis is truly a wonderful recipe Lisa, I love how you change a simple scones into a more elegant and delicious treats. I having seen freststrawberry scone before, nice combination making them look so full of mystery of goodness. Just amazing and yet simple. I like that you left the strawberries in chunks rather that mashing them. So when you bite into them you get a nice piece of fresh strawberry. Wow,...Lisa! You have created a wonderful scone!! I love the strawberry in it! It must be lovely to eat with clotted cream & strawberry jam! Ever since going on holiday to England, when I was a child, I have been a fan of tea & scones: a real cream tea! I would love to eat those with some tea and butter. 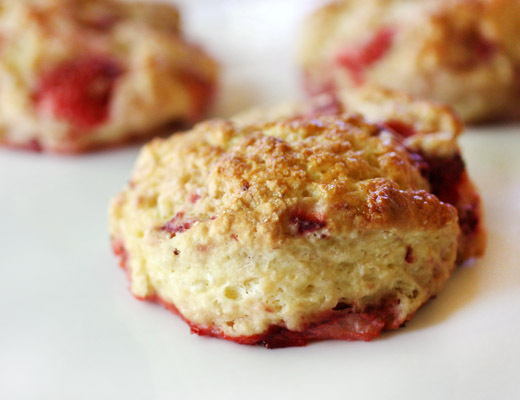 Or replace the biscuits in a strawberry shortcake with your gorgeous scones! Wow, I have only seen Scones with raisins, what a great idea to have strawberries in scones! I am drooling!!! Great recipe and the scones are so pretty! Delicious! I always thought a scone was just a fruity biscuit. Finally made some and the light went on--yum. What a beautiful spring combination. I love Passionate Eater's strawberry shortcake idea. Oh, scones! How I love them. Simon too (he's British and when he was a kid and other boys were buying remote control cars, he was spending his allowance on orange mint scones and Devonshire cream). I love that these scones are round -- Simon always complains about the wedge-shaped American scone so he'd accept this one on the merit of its form alone. Strawberries will be in season soon -- can't wait to try this. 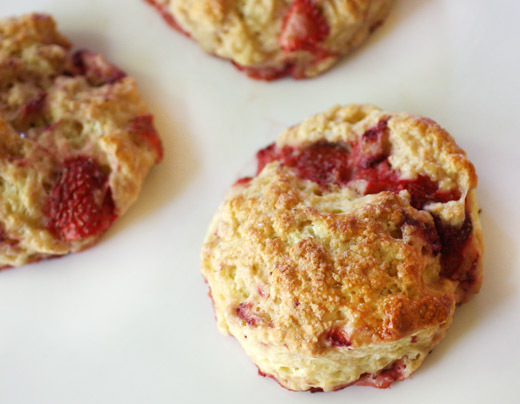 Mmmm strawberry scones sound like they would be perfection! I've never had them, they look gorgeous! I could go for one of these mouth-watering scones right now! How delicious! These look delicious! I'm still a novice when it comes to scones, but this looks like a great one to try. Beautiful scones. I made scones only once. I should start make those again. What great looking scones. I can taste the strawberries. Perfect. love the little specks of red in there! I think I'm gonna have to cross scones off my "fear food" list just for a taste of these! I'm seeing scones all over - I'm really jonesing for them (would that make it 'sconesing'?) These look delicious. I love how the strawberries really kept their shape! And thanks for the tip/link for making self-rising flour. 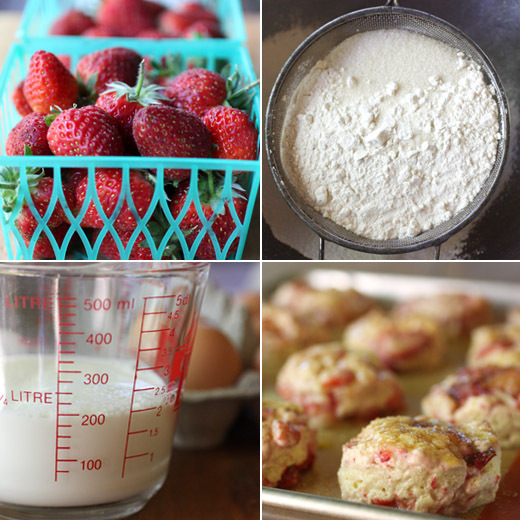 I've never made scones before and since strawberries are seasonal this would be a great recipe. I cannot get away from my favorite orange or lemon scones, but I am going to buy some fresh strawberries and go this route...how perfect they are! thanks for including the recipe--i thought these looked fantastic and would feed my never ending strawberry hole...guess it's time i bought that scale, huh? They're soooo yummy! :3 I can't understand why I've been waiting for such long time before my first attempt to make breakfast scones :) Really delicious. These look so amazing! Does anybody know the converted measurements used in non-metric measurements, like cup/TBS/tsp, etc? Can't wait to try it for NYE! Thanks!